Did you or someone you know recently get an iPad, iPhone or Mac computer? Are you getting or giving an iPad, iPhone or Mac this holiday season? That accessory is Noteboom Tutorials. 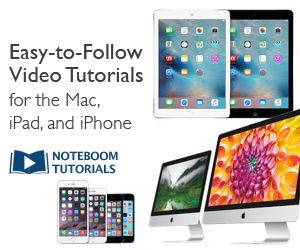 Noteboom offers hundreds of video lessons for the iPad, iPhone and Mac for one really low price. You also get hundreds of time-saving tips to make your Apple device more fun and less frustrating. Dan Wassink of Noteboom has taken online Apple training to a whole new level with great tips, tutorials and videos for apps, applications and Apple devices. Thousands of Apple owners already enjoy learning about the iPad, iPhone and Mac with Noteboom. I’m one of them. I just used Noteboom’s iMovie for Mac lessons to get ready to teach a new client about making movies with the Mac. Dan’s tutorials are excellent for beginners or for people like me who want an easy way to refresh skills or learn new applications. The cost? Usually $59 per year. But Dan’s running a special for $39. I think he’s crazy to offer so much for so little, but I appreciate his holiday spirit and “$20 gift” to you. I don’t know know how long this offer will last, so you should act fast. This Premium Membership includes unlimited access to all the Noteboom tutorials and tips for the Apple iPad, iPhone, Mac and Watch. Updated lessons are added regularly and you’ll get those too. Return and relearn as often as you want. You can even download many of the lessons to your device so you can watch and learn offline.